Give Your Best Friend The Best Training with Train Your Pup! The strongest human/canine bonds are formed through trust, and not fear. We here at Train Your Pup believe this statement, and provide you with training methods that are created to help foster that sort of environment. Our trainers provide guidance on discipline, boundaries, behavioral issues and much more! It doesn't matter if you're looking for at-home training, one-on-one training, group classes, or doggy day care - our team of trainers can help you create a strong foundation of obedience that will last a lifetime. Contact us to enroll today! Spots are filling up fast. The first step to helping you and your dog is a consultation with our Certified Professional Dog Trainer Danielle O'Neill. During our home visit, Danielle will assess your dog's behavior and discuss each problem in detail. We will evaluate the behaviors and their impact on each member of the family (human and other pets). Next, we'll create a comprehensive, customized behavioral modification plan. Just like every person doesn't learn the same, nor do dogs. We are able to put a timeline on how long it will take to achieve your goal due to the severity of problems and handler ability. Although our primary belief is based on positive reinforcement training methods we have many techniques to help customize a solution to fit almost any canine problem. Many dog daycare facilities have a large number of dogs, which can be overwhelming for dogs and nerve-racking for owners. Train Your Pup's daycare averages 20 dogs per day which is less stressful on the dogs and allows staff members to develop a relationship with each dog. 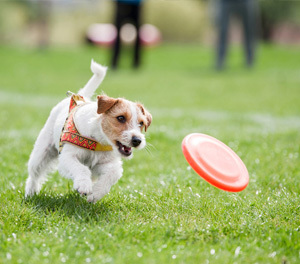 Often times owners complain that going to dog daycare causes unwanted behaviors such as jumping, play biting, housebreaking issues, and kennel reactivity. 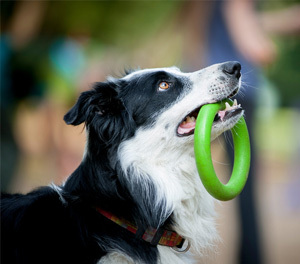 All of our staff members are knowledgeable in dog training techniques and will be sure to minimize rewarding unwanted behaviors using positive reinforcement techniques. There has been a recent popularity with dog owners wanting to spay/neuter their dogs until a year or older, and we allow these unfixed dogs on certain days. Many other dog day care facilities don't allow any unfixed dogs over 6 months to attend, but they don't realize these dogs are missing out on crucial socialization time! 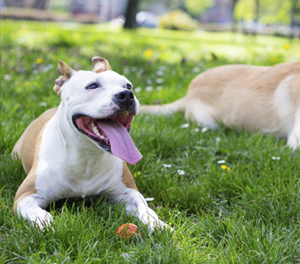 Unfixed dogs will still be given a behavioral evaluation to ensure that their behavior doesn't affect or influence the play groups. Unfixed males and females will never be allowed to attend on the same day. Danielle is amazing! Her common sense and consistent approach to dog training is right on point and the results are even more impressive. When at four months, our puppy could "sit" and "down" and "leave it," it made managing him so much easier and also impressed our family and friends that a dog so young could have that kind of self control. Hiring Danielle and Train Your Pup has been one of the best investments we could have made for our puppy and our family. Our family has been working with Danielle for about 5 months now and the transformation is unbelievable. Most of our pack behaviors were from our own behaviors and lack of discipline. We've gone from a family in chaos on the brink of trying to re-home one of our beloved fur babies, to a calm happy home environment & it's all because of Danielle! Now I'm ready for Danielle to turn Isabel into a disc dog! For effective dog training services in the Dayton or Centerville OH area, contact us today! Schedule your consultation and see why many dog owners have chosen Train Your Pup for their furry best friends. They deserve the best, and we can give it to them!